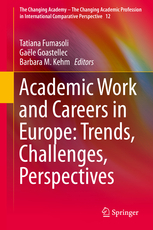 Changing working conditions at European universities are studied in a recent book ‘Academic Work and Careers in Europe – Trends, Challenges, Perspectives’, edited by Tatiana Fumasoli, Gaële Goastellec and Barbara Kehm. Tatiana Fumasoli tells about the main findings presented in the book. Q2: What are the main common trends in academic work and careers in Europe? Q3: What are the main differences between the eight European countries you analyze in the book? Q4: Are the main policies on academic careers made at national and institutional levels or does the European Union also play a role? There is no doubt that the EU is influencing the restructuring of academic careers and work. First, the standards of research for participating in the Framework Programs (on-going Horizon 2020) have diffused across EU members and ERA associate members. Second, the Commission has been involved in the Bologna process quite early. Third, the EU has contributed to enhance an understanding (and a legitimating role) of higher education institutions in the construction of Europe of Knowledge. This has focused the public debate also on the role of academics and their contribution to societies. Finally, the idea of a free market of knowledge is met with a certain criticism by most academics, who have to balance personal and family life with long years of uncertainty before achieving a permanent position. Q5: What are the main messages for policy-makers and practitioners? Europe has excellent academics in all scientific fields, however their careers and trajectories are prone to chance and to sometimes idiosyncratic choices. There is a waste of resources in forming academics, having them compete for positions, publications, research funding, that is arguably not efficient. If the knowledge society is key to socio-economic development, the role and organization of academic careers should be addressed more structurally at European and national levels. Professional organizations like universities rely on individuals (that is academics) for producing knowledge and not on technologies, structures, routines, which can be designed. From this point of view it is astonishing how few universities and higher education systems have addressed thoroughly academic careers in order to improve their performance. There is a tension between the traditional professional control on careers and the demands for more effective use of resources that should be addressed. Q6: What would be interesting avenues for future research? Academics are professionals with multiple affiliations and loyalties, as they are embedded in higher education institutions and discipline-based communities; as such they strive to protect their academic freedom and control of their teaching and research activities. The European dimension has become an arena where academic professional interests can be advocated and promoted. It is thus relevant to investigate how academics engage in European policy processes, how they link across Europe to other actors and arenas, and which factors empower and constrain them in protecting their professional interests. Given the increasing number of European academic associations, academies, scientific journals we should scrutinize how the integration of higher education and research at national and European level is affected. Academics’ engagement in European policy processes will be the topic of the panel “Transnational actors in the multi-level governance of knowledge policies” in the section “The Global Governance of Knowledge Policies: Europe of Knowledge in Context” at the ECPR General Conference in Montreal, August 2015. Dr. Tatiana Fumasoli is a Post-doctoral fellow at the ARENA Centre for European Studies, and an assistant professor at the Faculty of Educational Sciences, University of Oslo. Previously she was a researcher at the Institute of Management of University of Lugano (Switzerland), where she received her PhD with a thesis on strategy of higher education institutions. Tatiana presently works in the Flagship Project, funded by the Research Council of Norway, and investigating institutional change dynamics in European universities. Her interest lies on strategic agency of political and social actors and on its implications for policy and governance of higher education and research. Her work has appeared, among others, in Higher Education, Minerva, Higher Education Policy, International Journal of Public Administration, and with Springer and Palgrave. This entry was posted in Education, Politics & Public Policy, Science & Technology and tagged Bologna process, careers, Europe of Knowledge, European Higher Education Area, European Research Area, Framework Programme, higher education, research policy, universities. Bookmark the permalink.